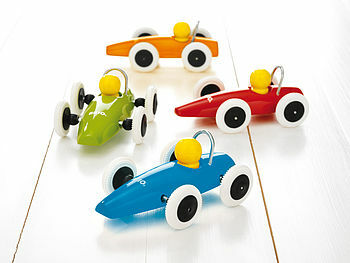 A traditional wooden racing car in a lovely array of colours. BRIOs freshly painted racing cars are now available in two colours; red and lime green. There is also a natural wood version (not shown) which has a yellow driver and white tyre wheels. The car comes complete with fixed driver and a chrome rollbar, sleek body design and white walled rubber wheels. Packaged in a neat box they make a great gift for your favourite child.